Whether you’re working with colleagues down the hall or across the ocean, success depends on being able to collaborate from anywhere, at any time, from any device. Our experts can customize voice, video or online collaboration tools to fit your user needs and your business goals. We offer on-premises, cloud-based and hybrid business communication solutions to help you create a flexible, scalable environment. With 61 percent of people working outside the office, organizations have to adjust the way they empower workers to collaborate. And that’s making the virtual meeting experience a core element of collaboration for any organization. Breaking down silos within the workforce can have a profound effect on productivity. Cisco Webex Teams allows interaction to scale seamlessly, from persistent messaging to voice and video calls to multiparty conferences and shared digital assets. In today’s modern workplace, users are asked to do their jobs on the road and at home. Learn how emerging communication tools and technologies let them do that and still maintain a healthy work-life balance. We can help you equip, set up and manage immersive telepresence rooms as well as formal and informal videoconferencing hubs, including cloud video bridges — all from leading partners. We’ll help you establish secured business platforms for enterprise email and messaging, creating customized solutions from top providers. We work with all the top providers, giving you a choice of solutions — desktop or mobile, wired or VoIP telephony, on premises or in the cloud. Our omnichannel contact center solutions align with how your customers prefer to communicate with your business. We offer synchronous and asynchronous solutions for call center, email, messaging, video and social media channels to provide a more satisfying customer service experience. We also offer agent productivity suite solutions to better manage customer data and streamline workflow efficiencies within the contact center. We have a lot of people who work out of the office and travel internationally, so it’s great that we have Cisco Call Manager and can give them softphones via their computers with all those enhanced unified communications capabilities. [Our CDW solution] absolutely gives us a reliable phone system with the added benefits of instant messaging, accessing voicemail in email and call clarity. We partner with the most relevant industry leaders to provide you with a wide array of business communication solutions. Our experienced professionals are certified and recognized through these partnerships to ensure the highest levels of knowledge and solution expertise. We work with you to understand your current infrastructure and design a foundational telephony, videoconferencing and messaging solution that will leverage your past investments while also creating a modern, future-proof framework that promotes efficiency and user connectivity. Our team is here for you every step of the way, from assessment and design to implementation, adoption and ongoing management of your business communication solution. 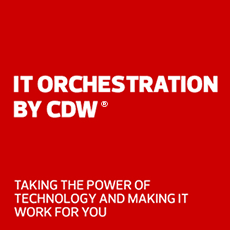 CDW also helps you transition at your own pace from legacy infrastructures to more up-to-date, sustainable solutions. Request a free Collaboration Workshop, or call now to get expert advice.